If a permanent resident is outside Canada and a visa officer with Citizenship and Immigration Canada (also outside Canada) finds that the permanent resident has not met this minimum residency obligation, the person may lose their status as a permanent resident. The permanent resident may appeal the CIC decision to the Immigration Appeal Division (IAD) no later than 60 days after receiving the decision letter from CIC. If the appellant is outside Canada, but had been present in Canada at any time over the past 365 days, CIC must provide the appellant with a travel document to enter Canada. In other cases, the person may apply to the IAD for such a travel document. If the IAD determines that the person should attend the hearings in person, it may issue an order. CIC will then issue a travel document for the appellant to travel to Canada for the hearing. Otherwise, the hearing may be held by telephone. The appeal process is adversarial and involves two parties, i.e. the appellant, and the Minister’s counsel who represents CIC. These hearings are open to the public, so members of the media or public may observe or report on the proceedings. You may believe and be able to prove that the decision of the CIC officer is wrong in law and wrong in fact. Another way to win the appeal is show that there are humanitarian and compassionate reasons to grant the appeal even if the CIC decision was correct in law and fact. You must be able to provide a reasonable explanation for your absence from Canada and show that your absence, no matter how long, was always meant to be temporary. If the appeal on residency obligation is allowed, the IAD will set aside CIC’s decision and the person will be able to keep his or her permanent residence status. 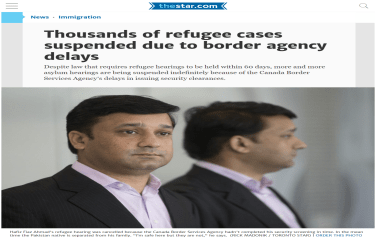 If the appeal is denied, the person will lose permanent resident status. If the appellant is in Canada, the IAD will order his or her removal. Either party can then apply to the Federal Court of Canada for permission for judicial review of the IAD decision. The Federal Court may dismiss the leave application or return the case to the IAD for re-hearing.